ManageWP is a service that makes it simpler to manage your multiple WordPress sites. Designed for people who spend a significant amount of time managing their own or their clients’ sites and are seeking for an easier and more convenient solution. ManageWP gives you a choice of three different premium plans and performs many of the tasks that you would otherwise have to do manually. For people who have many WordPress sites to manage, this type of service can be a valuable time-saving tool. In this ManageWP review, we will look at the main features of ManageWP and explore the cost and value. We are also providing an exclusive ManageWP discount to our readers at the end of the review. Let’s look at some of the most important features of this service. First and foremost, ManageWP allows you to manage multiple WordPress sites from a single Dashboard. There are a number of ways this can help you. Keep in mind that not all features are available with all plans. Updates -WordPress schedules frequent updates, which are essential for performance and security. You may also have themes and plugins on your sites that require updates. Updating sites manually, however, takes time. With ManageWP, you can update as many sites as you want at one time. Backups -Backing up your content is very important if you want to safeguard everything. Otherwise, you could lose everything if there is a problem with your system or you are hacked. Backing up sites manually can be a daunting task, but with ManageWP you can schedule automatic updates for all of your sites. You can also decide where to store backups, such as on Amazon S3 or Dropbox. Manage Your Content -You may want to post content to many sites at once. ManageWP makes bulk posting easy. You only have to create the content and post it once without logging into each of your sites separately. SEO, Keywords and Analytics -ManageWP has tools to help you improve the SEO of your WordPress sites. This includes keyword rankings, Google Analytics integration and detailed SEO analysis. Deployment and Migrations -Deployment is for when you want to create clones of existing WP sites. You may, for example, want to sell a number of sites with the same theme. Migrations allow you to move all of your sites to another web host. ManageWP makes these otherwise tedious tasks simple. Monitoring and Alerts -ManageWP monitors the uptime of your sites. If there is a problem, you will be quickly notified. This helps you avoid the costs associated with prolonged downtime on business sites. You can also get alerts for things such as other sites linking to you, viral posts or attacks on any of your sites. Security -ManageWP adds security features beyond what you ordinarily get from WordPress. It integrates with Sucuri.net, which monitors your sites for viruses and malware. It also provides two-factor authentication, making it harder for hackers or unauthorized people to log into your sites. 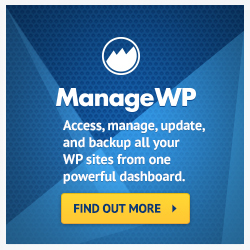 ManageWP have several different plans, depending on what features you need and how many WP sites you are managing. Mind that you can manage up to 5 websites for free, though this plan lacks some of the features that premium plans have. Standard -This plan is meant for individual bloggers who may have a few WP sites. This plan includes all of the basic features, including one-click log-in to any dashboard, one-click updates, managing themes and plugins and manual updates. The cost of this plan is .80 per website/ month. Professional -This is a plan for small businesses, online marketers and web developers. In addition to all of the features of the Standard plan, you get scheduled backups, client reports, Google Analytics integration and Clone Wizard. The cost of this plan is $2.40 per website/ month. Business -This is a plan for larger businesses, SEO companies and people with high traffic websites. In addition to Standard and Professional features, this plan adds white labeling, comprehensive SEO analysis, uptime monitoring and search engine ranking tracker. The cost of this plan is $4.80 per website/month. ManageWP is a useful service for anyone with multiple WordPress sites who wants to save time on tasks such as updates, backups, content management and SEO. If you only have one WP site, you probably don’t need these benefits. Anyone with several sites, or a large number of sites, however, will appreciate the convenience of managing them all from one dashboard. If you are thinking of signing up for ManageWP, make sure you choose the plan that works best for you. Even if you are a small business or solo entrepreneur, you may be able to benefit from the SEO and analytics features of the Business plan. With our ManageWP discount coupon below, the expense is significantly reduced. ManageWP offers good value, especially because it bills you per site. This means you are never paying for services you don’t need. WordPress is a convenient and versatile blogging platform, but for people with multiple sites it can get complicated to keep track of them all. ManageWP is a convenient and reasonably priced tool that makes it easy to manage all of your WP sites. Because we believe that ManageWP provides such great value to our readers, we offer new users an exclusive 15% PayPal cash back bonus on the first payment to ManageWP (whether it is monthly, annual or biannual) for subscribing via our link here or via the button below. To take advantage of our 15% bonus, make sure to read our instructions page and forward us the purchase proof to info[at]impromocoder[dot]com with ‘ManageWP Discount’ as the title. Don’t hesistate to contact us if you have any other questions! Best of luck!